The second edition of the Filmmuseum Biennale has a special treat in store for film buffs. 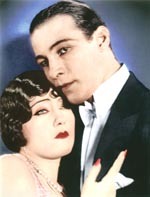 "Beyond the Rocks", a classic 1922 film directed by Sam Wood and the only film starring Gloria Swanson and Rudolph Valentino together has recently been restored in its entirety (with the exception of some seconds destroyed by nitrate deterioration) and, with an exciting new score by Henny Vrienten, will be premiered at a gala performance in the Pathé Tuschinski Cinema on Tuesday, April 5th. During the week of the Filmmuseum Biennale 05 it continued to screened evenings at the Filmmuseum Cinerama Calypso. Another recently restored film, "La Coquille et le Clergyman" directed by Germain Dulac, which is believed by some to be the earliest surrealist film ever made, will be screened on Wednesday, April 6th at the Stadsschouwburg with live accompaniment by the Asko Ensemble. The script for this film was written by none other than Antonin Artaud. Singer and composer Fay Lovsky will perform live with her newly designed soundscape for the 1927 adventure film "Le Mystère de la Tour Eiffel" on Wednesday, April 7th. Mary Miles Minter will be traipsing across the silver screen again as a teener in "Innocence of Lizette" and "A Dream or Two Ago." The film diva Asta Nielsen is to be given a good deal of attention by screening some of her films as well as a documentary about her life. And, in the Dutch corner, Wim Verstappens "Dakota" starring Kees Brusse, who recently celebrated his eightieth birthday, will be screened as well as Fons Rademakers recently restored "Als Twee Druppels Water" ("Spitting Image") along with other films under the title Dutch Glory. And the filmmaker of choice for the special spotlight this year is Henri Plat (1936), whose works will be screened in a continuous loop during the entire week. His latest film "A Fleeting Dream" will also be screened during the festival and a special exhibition of his artwork has been mounted by the Filmmuseum for the event. More, lots more, in store, but it is wisest to check www.filmmuseum.nl for information regarding films, dates, times, locations, and ticket prices for the Biennale week which runs from April 5th through 10th. Keep an eye open for our reviews after the screens go dark. We much appreciate comments, suggestions and bug reports.